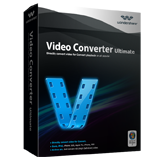 Wondershare Video Converter Ultimate is a blazing-fast drag-and-drop digital video converter, DVD burner and converter, which lets you convert videos/DVDs to and from virtually any video format out there, with 30X faster conversion speed.Stop limiting your video entertainment options on your PC. Make your movies versatile by instantly converting them to AVI, WMV, MP4, MKV, FLV, 3GP, MPG–even convert video to 3D. Burn video files to DVD disc, DVD folder, or ISO files, download or record videos from YouTube, Google, Yahoo, Myspace, CNN and other video-sharing sites, convert home DVD movies to any video/audio, for playback on devices. The program offers some default settings for iPhone (iPhone 5 included)/iPad/iPod/PSP/HTC, Windows Media Player/Movie Maker and other popular devices and apps. Taking an eternity to convert a single video clip ? Converting a movie you want to watch to the format you need shouldn't be a test of patience. Wondershare Ultimate Video Converter provides up to 30X Faster Video Conversion than the competition ! - Convert Video to Virtually any Format. - With an ultra-intuitive user experience, anyone can easily convert video to 158 formats, including MOV, M4V, MP4, WMV, MKV, AVI, XviD,MPEG, DVD-Video, FLV, 3GP and loads more--perfect to fit your iPad, iPhone (iPhone 5 included), iPod, android,windows Phone,PSP, Xbox 360 and a rainbow of other devices. - Convert Home DVD to various video formats. - Burn multiple files simultaneously in batch. 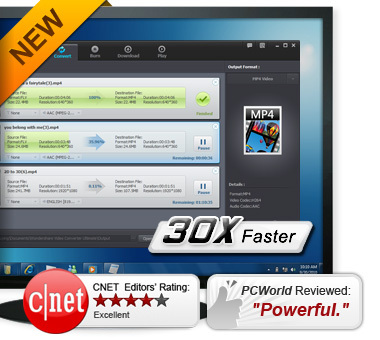 - Edit and Enhance to Personalize Your Media Files.